Our Silent Showman wines are named in honour of Sir George Tallis, a live theatre entrepreneur and the man behind the world's largest entertainment organisation in the 1920's. Sir George Tallis was a modest man, not given to self promotion therefore his story and many accomplishments remain largely unknown. In his honour, our flagship range, the Silent Showman are wines produced from the best grapes in the vineyard and only in the best vintages. 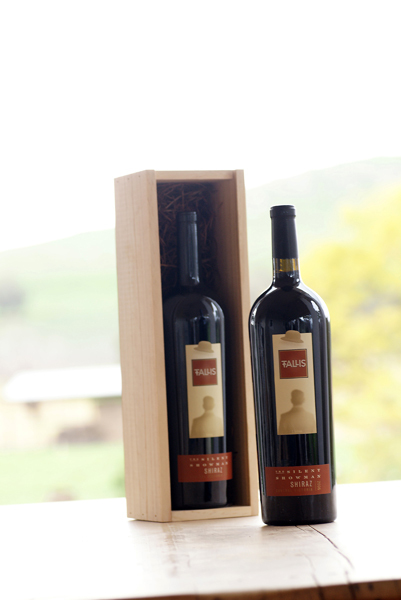 This limited release magnum is produced from the best shiraz grapes in the Tallis Wine vineyard. Inky purple in the glass, the nose opens with concentrated blackberry and licorice aromas and the elegant palate shows depth of flavour and complexity. This wine displays excellent cellaring potential due to the abundance of flavour and the ripe, smooth tannins. Cellar for many years or enjoy now with (lots of) friends. ALC/VOL 14.9%. Approx 17.6 standard drinks. Preservative 220 added.